There is nothing, absolutely nothing, like playing for the right to be called CHAMPIONS — declared the best in the land. That’s what’s on the line starting Thursday at Wilson’s Group Stadium at RAP and Lambrick Park, when B.C.’s beautiful capital city plays host to the 2018 Baseball Canada Men’s Championship for the second-and-final time. And, a bonus to all fans who buy a TOURNAMENT PASS for $75 — you are entered in a draw for a V2V Vacations ROYAL PASS return trip for two, valued at $720.00. Former pro and college players fill the rosters of the 10 teams split into two pools — Ontario1, New Brunswick, Nova Scotia, Manitoba and the host Victoria squad on one side, and Ontario2, BC, Alberta, Quebec and Newfoundland on the other. Victoria’s team is managed by Jim Swanson of the HarbourCats, with current HarbourCats coach Troy Birtwistle also part of the leadership group. No less than eight former HarbourCats — Connor Russell, Austin Russell, Charlie Strandlund, Dylan Thorp, Brodan Bydeweg, Alex Rogers, Brady Rogers and Eric Hegadoren — strengthen a lineup that includes 18 players from Vancouver Island. Former pro players Kurt Horne and Kyle Orr, both of Victoria, bring a presence to the roster. In fact, there are at least 13 former or current HarbourCats taking part, underscoring the high level of this tournament. Ontario1 is the Tecumseh Thunder, perennial powerhouse and regular winner of one of the toughest tournaments in baseball — the massive double-knockout event that determines the Ontario champion. Ontario2 is Ilderton Red Army, returning to nationals for the first time since 2010. Team BC is the Coquitlam Angels, which faced the HarbourCats in two tight games in June at Wilson’s Group Stadium. 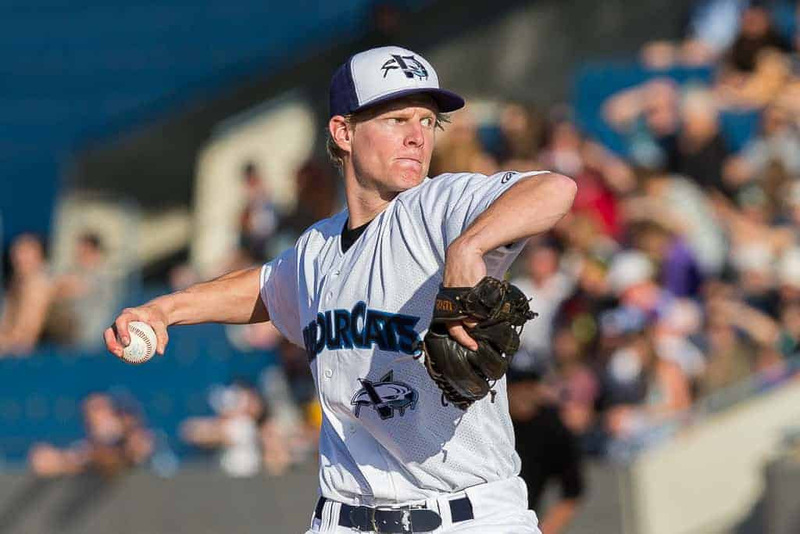 Among the players on the Angels is former HarbourCats pitcher Luke Manuel, and 2014 HarbourCats outfielder Darren Honeysett. Alberta is represented again by the Red Deer Riggers, last year’s bronze-medal team, and includes former HarbourCats player and Victoria native Ty Russell. The Oak River Dodgers represent Manitoba, while Quebec is an all-star team from their strong senior league — managed by veteran nationals coach Daniel Belisle, Quebec was not at last year’s nationals. Newfoundland is a mostly-St. John’s team managed again by Sean Gulliver, with the legendary Troy Croft, the oldest player in the tournament at 45, back for another nationals. Nova Scotia has a new representative in the Sydney Sooners, while the Moncton Fisher Cats with BC-bred pitcher Shane Kraemer (a former Kelowna Falcon) leading the staff, representing New Brunswick. The Fisher Cats, like last year’s New Brunswick reps, have picked up many players from around their senior league. Things get going Wednesday night August 22 at Wilson’s Group Stadium at RAP with the Home Run Derby, starting at 6pm, and games begin on Thursday morning, using both Wilson’s Group Stadium at RAP and Lambrick Park. 2018 Men’s Nationals Tickets are now on sale at the HarbourCats offices at 1814 Vancouver Street in Victoria, or by calling 778-265-0327. Tournament Passes, which include the Home Run Derby and all 17 games at Wilson’s Group Stadium are $75, Game Day passes are $20 Thursday, Friday and Saturday and $30 Sunday. Individual game tickets are $8 for games Thursday, Friday and Saturday and $10 for games Sunday. Entry for the Home Run Derby Wednesday night is $5. Games at Lambrick Park are by donation, or covered with your purchase of a day pass or tournament pass.